He was constitutionally incapable of being dull, says editor Andrew Scrimgeour of Robert Funk. You do not need caffeine to stay awake through a Funk speech or essay. Robert Walter Funk, founder of the Jesus Seminar, was a leading New Testament scholar of the second half of the twentieth century. A natural problem solver and keen observer of life, he was educated at Butler and Vanderbilt and taught at universities from Cambridge, Mass to Missoula, Montana. In Just Call Me Bob, Funk delights and enlightens reader with his reflections on a wide variety of topics which, not surprisingly, include God, the Bible, Jesus, and academia. 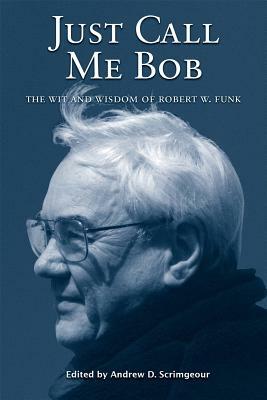 Scrimgeour has done a yeomans task, researching and then consolidating the wit and wisdom of Robert Funk under one cover. The result is a rich collection of sayings and writings, at times poignant, at times profound, even, at times, pugnacious. If we cannot laugh at ourselves and even about the things we hold dear, then God's reign has eluded us, Funk said on one occasion. The acquisition of information is no certain cure of ignorance, he said on another. In 1975 he wrote, Readers of the gospels speak glibly about the religion of Jesus because his followers created a religion about Jesus. It is not at all clear that religion concerns Jesus. To those who would address him as Doctor, Funk would respond, My name is Bob. Just Call Me Bob keeps faith with that sentiment. In its pages one comes to know the man through his ideas. And that, as readers will intuit, is the way he would have wanted it.